Though the entire gang from The Muppets won't hit theaters until just before the November holiday of Thanksgiving, as we wrap up October on Halloween today, a few of our puppet friends have sent a special holiday wish our way. 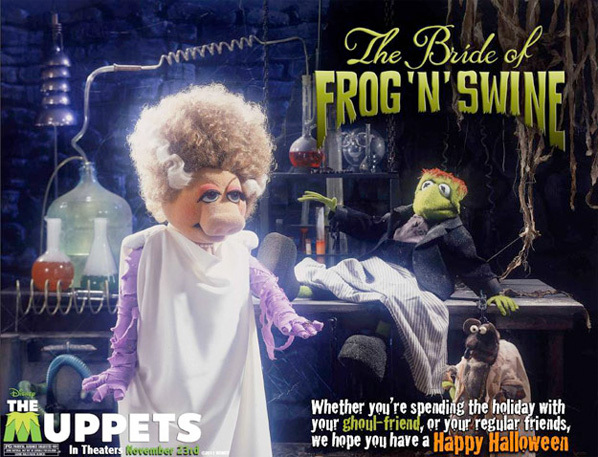 The most recent trailer for the film included parodies of films like Paranormal Activity 3 and The Twilight Saga: Breaking Dawn - Part I, but today Kermit the Frog, Miss Piggy and Rizzo the Rat reach back into horror classics to emulate the tale of The Bride of Frankenstein in the form of The Bride of Frog and Swine. Check out the full photo below and enjoy the rest of Halloween! James Bobin ("Flight of the Conchords") is at the helm of this new Muppets movie, which follows Walter and Gary (Segel), two die-hard Muppet fans and roommates who must save Muppet Theater by reuniting Kermit, Piggy, and the entire troupe to stage an "old-fashioned extravaganza." The cast is full of all kinds of celebrity cameos and other great random appearances, including Amy Adams, Chris Cooper, Rashida Jones, Zach Galifianakis, Ricky Gervais, Alan Arkin and Billy Crystal. We've been waiting for this! Disney will be bringing The Muppets to theaters starting November 23rd this Thanksgiving. It's almost here, can't wait! I'm a big Miss Piggy fan. Hope she comes off well in this new movie.